The ambition of youth, and the realisation of achieving a level of success, must be a satisfying feeling for any musician, actor, artist and so on. China Crisis was formed in Kirkby in 1979 by Gary Daly and Eddie Lundon and, by 1982, was in the single charts with their debut single “African and White”. Both were born in 1962, and they have remained close friends as well as musical partners throughout their thirty nine year career. By 1985 they had released two long players. They then approached Walter Becker of Steely Dan to produce “Flaunt the Imperfection” in Parkgate Studios, East Sussex. Tonight’s gig, in the Epstein Theatre, was dedicated to this breakthrough album to which Gary Daly commented, “They honed their sound”. Walter Becker died in 2017, and Gary Daly paid homage to him several times throughout the gig. Bands playing complete studio albums is a reinvention of touring, keeping the creative musical mind active, a rejuvenation of creativity and an opportunity to honour the past as a time of growth, reflecting on your creative evolvement. So China Crisis performing “Flaunt the Imperfection” in its entirety, is merely following the recent examples of Sparks or Gary Numan. China Crisis got undeservedly overlooked in the 1980s and looking back at the quality production of their music, it came as no surprise to any China Crisis fan, or fans of music, that this still stands out strong today; “Flaunt the Imperfection is testament to that. The live version proved that being a talented musician and writer, can have longevity. 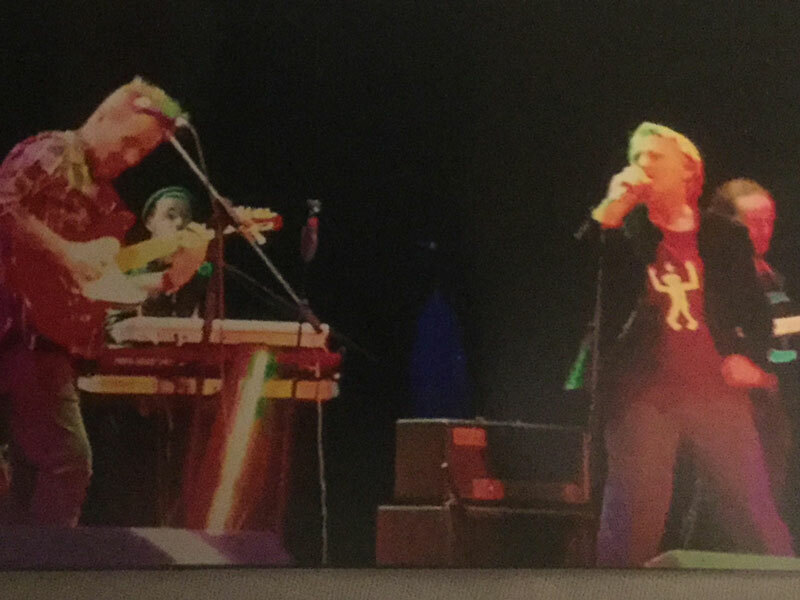 Their experience of being able to craft a song hasn’t deserted them, and judging by their last release in 2015, “Autumn in the Neighbourhood “, Gary and Eddie’s talent still burns brightly. Tonight’s gig was also mixed in with the dialogue of Gary Daly between songs, becoming close to part banter, part stand-up comedy whilst Eddie tuned up his guitar for the next song. The banter has become an important cog of the gig, having witnessed their live act at the Citadel, St Helens in 2015. At one stage, Gary Daly commented, “If the Liverpool Echo is in tonight, give us a good review, we’ve no money for promotion”. I’m positive there were a few expletive words in that sentence, but I lost count of the swear words throughout the gig. Behind the band, was a large screen where images from China Crisis’s past were displayed. There were a few bad haircuts, images of Walter Becker and a photo of my old secondary school, St Kevin’s, also Gary and Eddie’s, which is now a housing estate. After completing an impressive journey of “Flaunt” including an excellent version of “King in a Catholic Style” and “Black Man Ray”, the band took a twenty Minute recess, returning to play a hits section including “Best Kept Secret”, “Arizona sky”, “Hannah Hannah” and completing the concert with their debut single, ”African and White”. From Kirkby to touring the world, China Crisis have achieved their youthful ambition and created a back catalogue the envy of many a musician, and have a musical partnership based on friendship and talent. Kirkby has produced many fine sports people and now, two working class musicians; maybe it’s time to recognise China Crisis, Kirkby’s musical representatives.